MassGenie continues to change the way consumers shop online in the US, similar to what Pinduoduo did in China. Announces planned launch of MassGenie’s Social Sharing Community by the end of March. MassGenie announced today that its gross merchant volume (GMV) for January and February 2019 was $2.3 million, which was a 2,576% increase compared to January and February 2018. Social Sharing website visitors in January and February 2019 increased by 4,162% and GMV as a result from Social Sharing increased by 10,639% compared to the same period in 2018. MassGenie also announced that they would be adding their own version of community to http://www.massgenie.com by the end of the quarter. 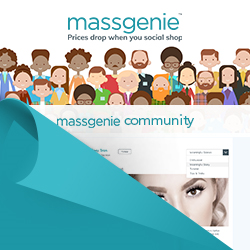 The MassGenie Community will give MassGenie customers a place to connect, learn, and shop with people who share their interests. MassGenie has recently opened up their Series A round which is expected to close in Q2 2019. MassGenie is a unique online social shopping marketplace site, which combines the power of crowdsourcing and e-commerce. Coding started on MassGenie in 2015 and the site soft launched in 2017. Follow MassGenie on Facebook, Instagram, Twitter, LinkedIn and YouTube. MassGenie was founded and is led by veterans in the ecommerce, marketplace and software industries. To learn more about MassGenie, visit https://www.massgenie.com/.